It takes "faith" to please God. Faith seems to come in all different sizes. Some people have great faith and believe for things that others believe could never happen. For many faith is used only when necessary and extends to the point of possibility in our own mind. And some people never step out of their own power into a dimension of "God power" or faith in motion. I am so grateful that God puts all of us, wherever we are on the faith spectrum, in the midst of the Body of Christ to learn and grow together. I want that kind of faith that makes people notice the awesome power of God and give Him glory. Faith that makes history. Audacious faith. Like Joshua. Joshua had audacious faith. Once when he was in battle the Lord told him to completely kill off the army: leave no one alive. Joshua understood that when the Lord tells you to do something, you should do it the way He says. Leave no one alive. The problem he had was that his battle was not over but the daylight was. He needed more time. Some folks would have given up and simply said they ran out of time. No one had ever thought of asking for more time! But Joshua did! He looked up at the sun, and prayed a simple prayer: sun stand still! I am sure that some of his companions thought he'd really lost it. 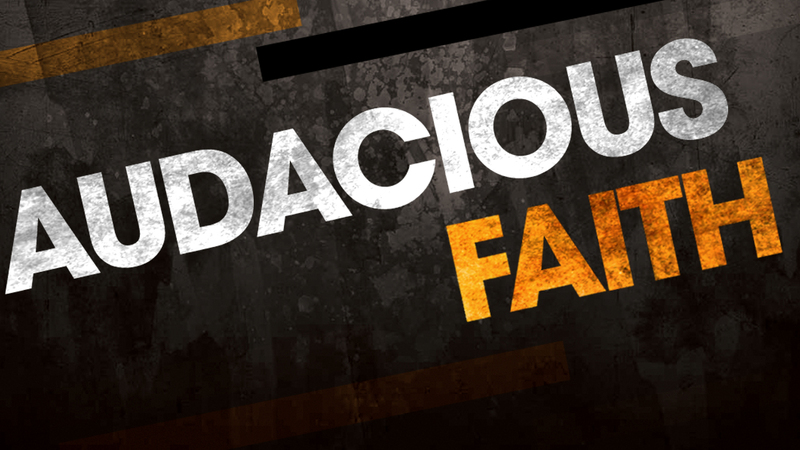 Audacious faith often breeds that result. The end result of that prayer was that the sun stood still, daylight stayed and no one got to go home cause Joshua did as God told him to. He killed every last one of the enemy. When was the last time you stepped out and prayed a prayer that was so far beyond your power that it could only come true if God intervened? Let today be the day you start going farther, and believing for things that most would think impossible. God has BIG plans in store for YOU! Know this, when you are walking with the Lord and trusting in Him, ALL things are possible! It's time to put some audacious faith into action.